GUNSIGHT PASS - Sitting in dusty road construction traffic isn't my idea of fun, let alone doing it four times in one morning before ever setting foot on a trail. 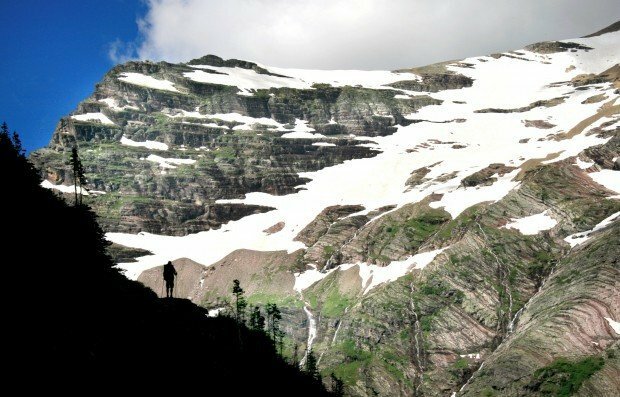 My only solace was knowing that by nightfall I'd be sleeping under the stars in Glacier National Park's backcountry for the first time. My wife Jen and I recently made our annual summer foray into the park, and every year we look for new places to stay and new trails to hike. We've lodged in lodges and camped out of our car, walked paths popular in Many Glacier and quiet in Two Medicine. But before this year, we hadn't spent much time in the St. Mary Lake or Lake McDonald areas, and we'd never camped in the backcountry. So last month, we made a short-notice reservation to pitch our tent at a couple of sites along the Gunsight Pass trail bridging the regions and crossing the Continental Divide. While the 20-mile route can be hiked in a long day, we took our time and plenty of pictures. 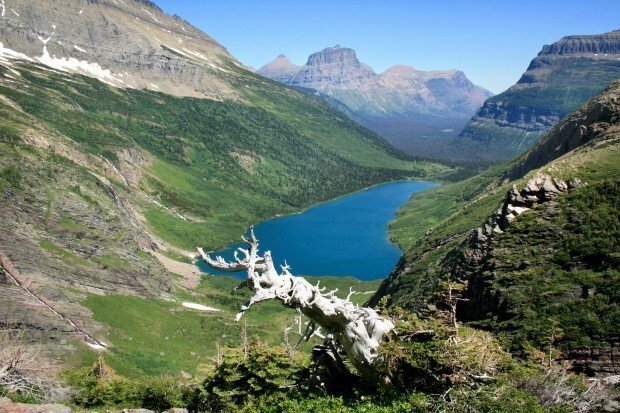 The route begins and ends in fairly dense forest with little to see but trees, but the middle section is what Glacier is all about: sharp peaks, lingering snowfields, the rush of waterfalls, blue lakes, wildflowers and wildlife. In fact, aside from the Logan Pass area, I don't think I've ever seen so many mountain goats up close during a park outing. They were lying in the trail, checking out our camp and even circling at dinner one night. We arrived under cloudy, rainy skies at dinnertime the night before our adventure began, and after a meal and a few photos on St. Mary Lake, we rolled out our sleeping bags in the back of our Subaru rather than start the trip with a wet tent. The next morning, we rose early and picked up our permit at the St. Mary Visitor Center by 7:30 a.m., then went about positioning our car at the end of our trip. This required driving west back over Logan Pass on the scenic Going-to-the-Sun Road and parking at Lake McDonald Lodge, then catching the park shuttle back to the trailhead on the east side, transferring buses at the pass. Unfortunately, this meant going through the two Sun Road construction zones twice, which took about five hours. (Didn't we leave all the roadwork behind in downtown Missoula?) We had the option of driving through all of it up front or splitting it between our first and last days in the park - I don't think I would have had as much patience that final day, though. Our route began at Jackson Glacier Overlook, dropping through the forest to Deadwood Falls on Reynolds Creek at 1 1/2 miles, crossing on a suspension bridge, then continuing southwest roughly along the St. Mary River. Along the way, the trees thin and you begin to see the mountains of the area. At about four miles, we arrived at a junction for Florence Falls. We decided to check it out, but afterward concluded it would have been better to stick to the main trail - while the falls were big and beautiful, the trail was almost too overgrown for backpacks. From the junction, the trail climbs steadily along the base of Fusillade Mountain, rising out of the trees and providing views of Mount Jackson, Blackfoot Mountain, their respective glaciers and Mount Logan. Along this stretch, a bouquet of wildflowers was blooming from the moist uphill side of the trail - yellow columbine, bog orchid, fringed grass-of-Parnassus. At about 6 1/4 miles, the trail arrives at the camp on the eastern end of Gunsight Lake. A notch above the west end of the lake marks Gunsight Pass, and waterfalls cascade down the rocky red and brushy green slopes all around. Here, we camped under cloudy skies in one of the sites scattered among the trees, sharing mealtime with a handful of other backpackers, a couple of nosy deer and at least one snowshoe hare. The next morning, we awoke to nearly clear skies, and after some breakfast chat with other campers we packed up and hit the trail over Gunsight Pass to Lake Ellen Wilson. This was our shortest day of hiking, but also the most scenic. After crossing the suspension bridge at Gunsight Lake's outlet, we followed the path as it climbed the side of Mount Jackson. In the rocky traverse between two sets of switchbacks up the mountain, we encountered our first mountain goats of the day lying there in the middle of the trail. They rose and approached us, an inquisitive younger one cocking its head at us under the watchful eye of what was likely its mother. We continued onward and upward to the southwest, taking in the view across the blue lake and back down the valley, and eventually reaching the first of several lingering snowfields and runoff creeks that we would cross. This high stretch of trail before Gunsight Pass runs nearly level, and only the final high-angle snowfield forced most hikers to detour around it. At the top of the 6,946-foot pass at three miles, we stopped for a break and to take in the view down to Lake Ellen Wilson, our destination. After a snack and the entertainment of a few marmots that thought they were sneaky, we started down the rockier, drier switchbacks two miles to the campground. In camp, we pitched our tent at a nice, open site just off the shore of the lake and settled in for some relaxation. Soon, a trio of goats wandered into the area, grazing around us. As afternoon became dinnertime, more arrived and circled the campground cooking area within spork's reach. We never felt in danger, but at least one of the mother goats was uncomfortable with the close quarters, repeatedly chasing off others that came too close to her kid. At dusk, they followed as I explored the lake shore, leaving only as the last sunlight rose up the canyon wall. That evening was clear, so we slept without the rain fly, allowing us to take in the bright sky one night short of the full moon. The morning of our final day in the park, we rose as the sun arrived on the valley floor, packed and got under way, trailed out of camp by more goats. We made our way west through the rocky terrain and a final snowfield, up and around the end of the valley. There, one final goat perched on a picturesque boulder with the ridge on the opposite side of the drainage in the background. Toward Lincoln Pass, we caught our first glimpse of the Lake McDonald area. At Lincoln Pass near the three-mile mark, it's possible to make a quick off-trail scramble up Lincoln Peak to view the hanging valley that holds Lake Ellen Wilson above Lincoln Lake. Being that it was our longest day, and the angle of morning sunlight would have made pictures of the lakes and the cascading falls linking them impossible, we moved on. Not far down from the pass, we reached Sperry Chalet, where we rested for lunch. After that, it was a little more than six miles down, down, down and back into more dense forest, the shade of the trees providing relief from the afternoon heat. Arriving back on the Sun Road at Lake McDonald Lodge, where we cooled our heels in the lake. After three days of hiking west over the Divide, our delayed start paid off with a quick escape from the park and back home. News editor Justin Grigg can be reached at 523-5243 or at jgrigg@missoulian.com.